*this post contains affiliate and sponsored links, but the oppinions are my own. We talked before about how to minimize in the lives of our kids at Christmas. I thought I would create a gift list that can be helpful for adults. I was walking through Target yesterday and was blown away by how many generic meaningless gift items there were stuffed everywhere. Things to fill stockings and pass out at parties. I grabbed what I needed and left as soon as I could because the thought of all that stuff laying around it people’s homes during the coming year was a bit overwhelming. It seemed a bit hypercritical to talk about minimizing things in our homes and then putting out a gift list, but gifts can be so hard to come up with ideas for, which is what leads to just buying tons of stuff instead of that ONE THING that we know someone will love. Here are some gift list ideas for experiences and gifts that won’t take up space. 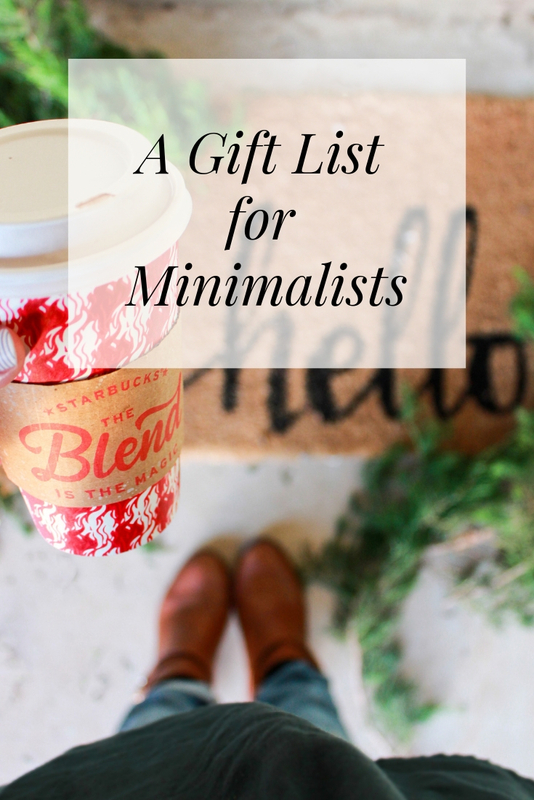 Whether the people you love are minimalist or adore gifts of all kinds, these may end up being the perfect fit. If not, hopefully, it will give you an idea for what the perfect fit would be for the person on your gift list. Classic pieces that work well with capsule wardrobes are best paired with trendy shoes. All my favorite fashion bloggers who wear flowing feminine dresses, and other classic pieces couple it with a trendy shoe, usually slides or mules. I don’t really like slides, because I chase kids and am worried one will go flying off as I chase kids. These Lucky Brand shoes that have the look of a slide, but then have a heel to keep your foot in (BINGO). They sold out on Nordstrom, but you can still find the same shoe here on Amazon. Joseph and I sign all our notes to one another with an infinity sign. It was a tradition we started right after we got engaged. I found a cheap, silver infinity ring at Old Navy a couple years ago and wore it every day. It broke pretty quickly and I was sad not to be able to wear it anymore. The ring had been just too thin for daily use. I was so excited when I was able to replace it with a ring from James Avery, I haven’t taken it off since I got it. It’s thick enough I’m sure it will stand the test of time much better than the first one. You can find the same one here! The best idea for this year was buying a year-long subscription to (something for someone this year). This got me thinking about how as a mom this past year what a big chunk of my reading I did through audiobook this year if you have a family member like me Audible might be great. We also use Spotify often and a subscription to that is pretty awesome. Netflix is another one that doesn’t cost much but could bring hours of enjoyment. The nice thing about a subscription gift is you don’t have to buy the entire year, you can do as many months as your budget. 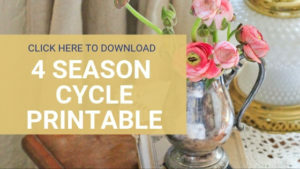 The person also can use it will out adding any additional items to their home! The first year my husband and I were married we started a traveling notebook. We take turns writing notes to one another and hide it for the other person to find. We try to hide it in somewhat difficult places, so there are stretches of time between the notes. But we always come back to it. There are the notes to one another from before children. We have thanked one another for the support through the pregnancy. Written about the struggles of the newborn stage of our first baby. We have recorded beautiful moments, and tough times. It’s like our own little time capsule. We have loved writing in the notebook and hope to carry on the tradition. It’s better than individual letters that we have to figure out how to store!! You can find the same kind of notebook we use here. Someone recently reminded me that no one ever hates a gift card. A friend mentioned someone had sent her a couple gift cards in college and it was the sweetest thing she received at that time. She said she didn’t have much money and being able to buy what she wanted was truly a treat. No shame in giving someone the gift of choices… unless maybe it’s your wife, then maybe go with the ring and a love letter notebook.